AC machines can be further classified as Induction machines and Synchronous machines. And hence, AC generators as Synchronous generators (commonly referred as alternators) and Induction generators (or asynchronous generators). There is significant difference between operating principles of synchronous and induction machines. For now, let us discuss the difference between synchronous generator and induction generator. In a synchronous generator, the waveform of generated voltage is synchronized with (directly corresponds to) the rotor speed. The frequency of output can be given as f = N * P / 120 Hz. where N is speed of the rotor in rpm and P is number of poles. In case of inductions generators, the output voltage frequency is regulated by the power system to which the induction generator is connected. If induction generator is supplying a standalone load, the output frequency will be slightly lower (by 2 or 3%) that calculated from the formula f = N * P / 120. Separate DC excitation system is required in an alternator (synchronous generator). Induction generator takes reactive power from the power system for field excitation. If an induction generator is meant to supply a standalone load, a capacitor bank needs to be connected to supply reactive power. Construction of induction generator is less complicated as it does not require brushes and slip ring arrangement. 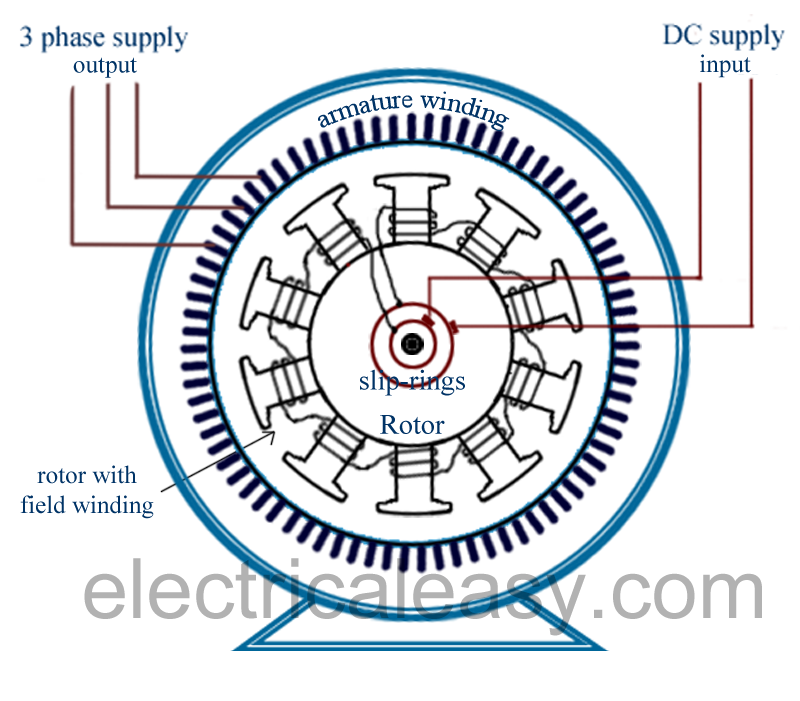 Brushes are required in synchronous generator to supply DC voltage to the rotor for excitation.